Opera has announced the technology that it believes can 'reinvent' the web, with the Opera Unite tool turning any computer into both a client and server, allowing people to host web sites from their home PC, or listen to their MP3s from anywhere with an internet connection. Opera has been teasing its new technology online for some time, and is clearly excited about the potential of Opera Unite, which will be available in a special version of the Opera 10 Desktop browser. Although there will be more to follow, currently Opera Unite offers a host of services, including the capacity to share files from your computer without waiting to upload it and running entire web sites from a local computer on the Opera Unite URL. 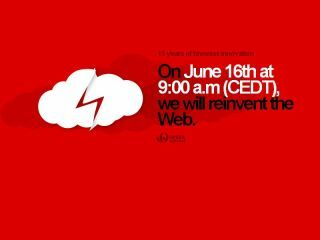 "Today, we are opening the full potential of the Web for everyone," said Jon von Tetzchner, CEO, Opera. "Technology moves in distinct cycles. PCs decentralized computing away from large mainframes. "Opera Unite now decentralizes and democratizes the cloud. With server capability in the browser, Web developers can create Web applications with profound ease. "Consumers have the flexibility to choose private and efficient ways of sharing information. "We believe Opera Unite is one of our most significant innovations yet, because it changes forever the fundamental fabric of the Web." Opera United is available from http://labs.opera.com/. File Sharing: Securely share a file from your personal computer without waiting to upload it. First select the folder from which you would like to share files. Opera Unite then generates a direct URL to that folder. By giving that link to your friends, you can share files without routing through a third-party Web service. Web Server: Run entire Web sites from your local computer with the Opera Unite Web Server. After selecting the folder containing your Web site, you can share and host it from the given Opera Unite URL. Opera Unite will automatically recognize index files and create the Web site as you designed it. Media Player: Rock out wherever you are by accessing your MP3s and playlists from any machine. After selecting the folder containing your playlist, use the Opera Unite direct link to play your tracks directly in any modern Web browser. Photo Sharing: Share your photos direct from your PC, without uploading them online. Once you select your photo folder, the photo-sharing service will create a thumbnail image gallery of your photos. Clicking the thumbnail will present the photo in its original resolution. The Lounge: The Lounge is a self-contained chat service running on your computer. Your friends can access the chat room via the direct link, which will not require them to sign into any service. Depending on your privacy settings, you need only provide the generated password to your service in order for people to log in to your chatroom. Fridge: Post a note on your friends' virtual refrigerators. By sharing the direct link to your refrigerator, you and your friends, family or colleagues can exchange notes securely and privately in real time.